The robotic octopus developed by Dimitris Tsakaris's research group at FORTH. A paper describing improvements to a robotic octopus by ECE/ISR alumnus Dimitris Tsakiris and his research group was a finalist for two different best paper awards at the 2014 IEEE International Conference on Intelligent Robots and Systems. The awards were the conference’s Best Paper Award (for the most outstanding paper presented at the conference) and the JTCF Novel Technology Paper Award for Amusement Culture (for practical technology contributing to toys, toy models, and amusement culture). "Multi-arm Robotic Swimming With Octopus-Inspired Compliant Web," by Michael Sfakiotakis, Asimina Kazakidi, Avgousta Chatzidaki, Theodoros Evdaimon and Tsakiris, showed how adding a soft and supple silicone web has nearly doubled the speed of the lab’s robotic octopus, which also can crawl, carry objects, and swim freely. The paper reveals that the robot octopus swims at just over 100 millimeters per second with arms only, but up to 180 mm/s (or 0.5 body lengths per second) with the new web design. In addition, the robot’s efficiency (aka overall cost of transport, the ratio of the energy put in over the resulting speed) for the arms-only version is 0.85, whereas the web drops the number down to 0.62. 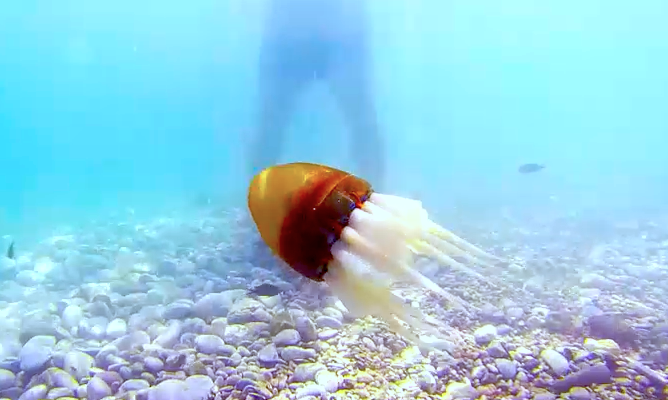 Watch the robot in action: swimming with arms only vs. with the web, crawling, swimming while carrying an object, and swimming in open water.